Republican Jim Ryan unveiled a poster representing “Rod Blagojevich’s shopping list” of proposals Wednesday, repeated the charge that his Democratic gubernatorial opponent has “lost his calculator” and made too many unrealistic campaign promises. Ryan, currently the Illinois attorney general, said Blagojevich has promised more than $800 million on the campaign trail despite the state’s budget shortfall. Ryan spoke alongside the poster of a colorful grocery bag, the front of which listed his opponent’s proposals, each with a price tag attached. The items listed included doubling the number of state parole officers, increased preschool funding and a prescription drug benefit for seniors. Ryan conceded that he has supported some of the initiatives on the “shopping list,” and that his own proposals would cost about $135 million, but said that is “a big difference” from his opponent’s plan. Ryan said he dealt with a budget gap as attorney general and would apply the same strategy as governor. “We had a $1.4 million budget deficit the day I walked into the office,” Ryan said. “Rather than going and asking the General Assembly for more money, I cut spending and we balanced the budget. “What I’m going to do — without raising taxes — is cut waste and redirect resources to be able to do these things,” Ryan said. 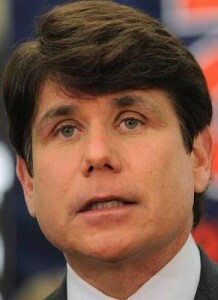 Blagojevich, a U.S. congressman who is leading in the polls, addressed these same issues at his news conference Tuesday. He admitted it would be hard to fund all his proposals, but said he would look through the entire state budget to “reprioritize” spending. Both candidates have pledged not to raise taxes, but both admit difficult decisions must be made in order to balance the state budget as required by the constitution.